While in London recently I took the opportunity to visit the West Africa: Word, Symbol, Song exhibition at the British Library. It’s an ambitious project tracing the history of West Africa from the rise of great scholarly cities to today’s writers and artistic creators through its literature, music and art. I came to it with a mixed bag of hooks; associations with strong musical traditions, the Atlantic slave trade, great medieval manuscript libraries, gold, news reports of rebel insurgencies and more recently the devastating ebola outbreak – I hoped to get beyond the headlines and come away with a better understanding of what makes this region of the world tick. Even so, had I just been walking past the red brick of the British Library, the vibrancy and energy of the Adrinka cloth print used on posters would have been enticement enough in itself to urge me inside. The first thing to take in is the scope of this exhibition spanning over a thousand years, 17 nations; Mauritania to Cameroon, Niger to Liberia and all between with more than 1000 spoken languages. It must have been a hard task deciding where to start, what to include. Giving coherence the exhibition follows five threads: Building States, Spirit, Crossings, Speaking Out and Story Now. Griots, musicians and story-tellers, have long held an important position in West African society, binding people together in the telling and re-telling of stories and it’s here you come in with a live performance of the epic legend of hero Sunjata – founder of the kingdom of Mali – playing out on screen. A little further along there’s an 1830 engraving of Timbuktu by René Caillié, the first European to make it to this mysterious city of fabled riches and come back alive. 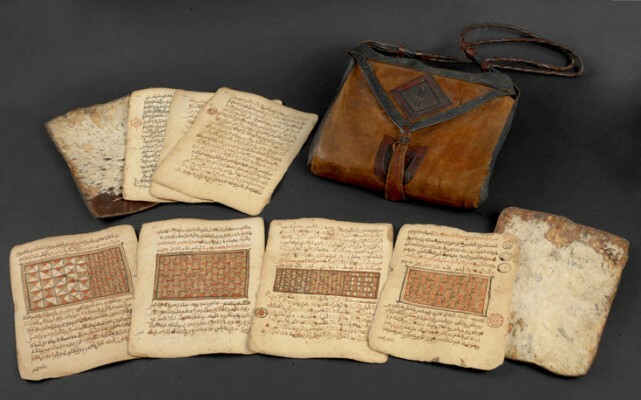 It’s heartening to learn that many of the famous centuries old manuscripts thought lost when the the city was overrun by Tuareg rebels in 2012 were actually hidden or smuggled out. The exhibition lends itself to finding your own path, pausing over items that catch your eye – beautiful manuscripts stand out, a tooled saddle bag Qur’an for reading on the go, the printed cloths celebrating people and events, a good husband even – but you shouldn’t pass over the less obvious exhibits that take more effort to absorb, for each adds to the story and there are some real gems. In ‘Crossings’ a gruesome 18th century diagram illustrating how to pack the most slaves, head to toe, into the hold of a ship, shocked anew looking at it for real despite knowing of it. While nearby there are published memoirs by a handful of slaves like, The History of Mary Prince – A West Indian Slave, Related by Herself which were to prove instrumental in the campaign to abolish slavery. From the years of colonial rule and times of strife in newly independent countries voices of protest (and hope too) come through powerfully, in letters and song, most graphically in the record cover lined booth given over to human rights activist and Afrobeat legend Fela Kuti. Throughout there are sound recordings to dip into- I hadn’t realized the British Library has one of the largest sound collections in the world – there are links to a few here including the 1921 recording of talking drums and a recording of one of the first hymns sung in Yoruba language by Nigerian Anglican priest Josiah Jesse Ransome-Kuti (grandfather of Fela). Christian missionaries taught them in English rather than local languages. 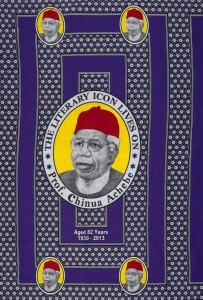 A look at the work of post-colonial authors and artists brings us right up to date – Chinua Achebe author of Things Fall Apart, Wole Soyinka, Africa’s first Nobel Prize winner, a host a young, exciting authors, many of them women. I’m currently being dazzled by the storytelling of Chimamanda Ngozi Adichie. There’s a lot to be found in this exhibition, though it will probably help to have some hooks or guidance to make the most of it. I left with much to think on, struck by the diversity, richness, eloquence and energy of West African culture. Do stop by if you can.